This is the part where I find out if I should have dyed my wool before carding or if I was right to do it after and, well, I was wrong. This time. So I’ve re-carded it all and am ready to start spinning. Like carding, there are many ways to spin yarn, and many many many different kinds of yarn to make. You can use a spindle (top or bottom whorl, supported, Navajo . . .) or a charkha (what Gandhi used) or a spinning wheel (Saxony, castle, modern, single or double treadle . . .). Heck, you can even use a plain old rock if you’re patient and particularly desperate. I’ve done it, just to see if I could. As for types of yarn, there are more of them than there are tools to spin with. Thick or thin (or both), woollen or worsted, plied or not, long or short draw, potential decorative elements, all these things and more contribute to what properties the yarn you end up with have. My spinning wheel is a Louet Victoria, a double-treadle folding travel wheel. Which is perfect for me because I live in a small basement suite, so when I’m not spinning I can just fold it up and stash it away somewhere. Or on nice days I can go and spin in the park. For this project, I’m not going to be too picky about how I spin. I’m going to knit the tea cozy in the round (no seams!) and then felt it, so in the finished product you’re not going to see much of the actual yarn itself. I’m going to a relatively thick (though I generally spin thin, so it won’t be true ‘bulky’ yarn), and probably just single ply. Although depending on my success with the making the yarn thickish, I might ply it anyways to thicken it up, so the tea actually stays cozy. Step One: Spin. See video. The carding one was too much fun, I wanted to do another. Plus it’s almost impossible to describe how to spin, even with pictures to help. Step One-and-a-half: Ply. This would be step two, if I was doing it, but I’m not, so I’m just putting it here in case you’re wondering when it happens. 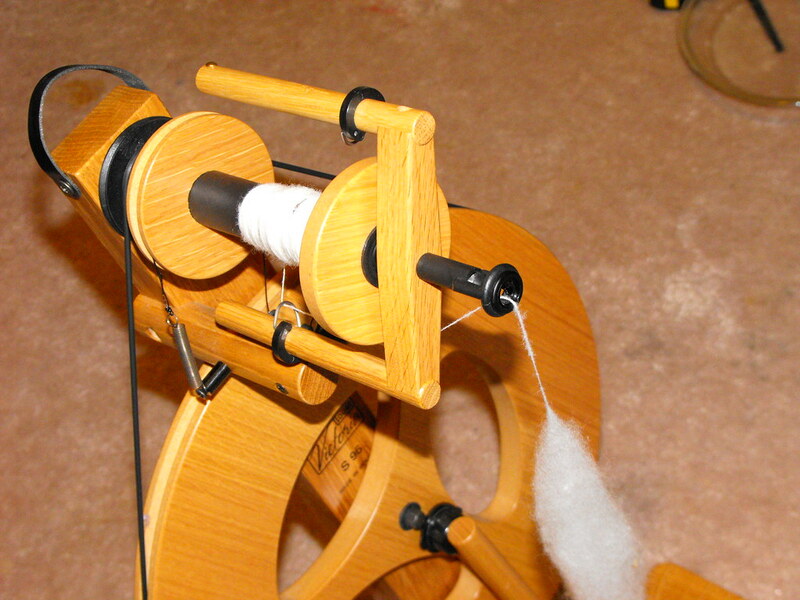 A brief explanation of plying: Spin approximately the same amount onto two bobbins. Spin the two parts (plies) together, spinning the opposite way. If the singles were spun clockwise, ply counter-clockwise. Ta da! You now have a 2-ply yarn. Step Two: Make a skein. Using a skein winder, niddy-noddy, a swift, or your friend’s arms, wind the skein off the bobbin and into a nice long loop. Like a coiled up extension cord. Step Three: Set the twist. When the skein is removed from the skein-making device, it will sproing and twist around all over itself, which is kind of inconvenient, and also causes problems when it comes to actually using the yarn. Knitting, for example, particularly with energized singles (not plied and twist not set) make the knitting slant off to one side, instead of gong straight up. So you have to set the twist. 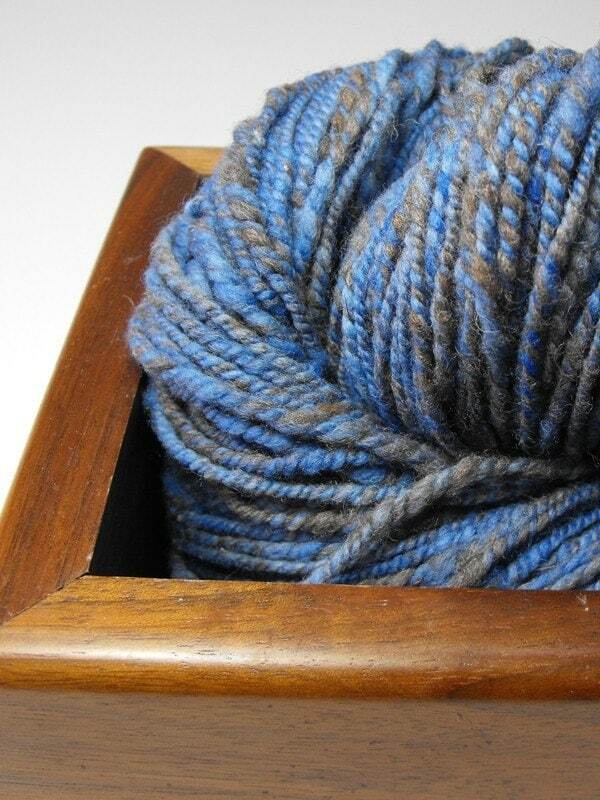 To do this, fill a sink/bowl with lukewarm water, and soak the skein for a while (I usually do at least 20 minutes). As with dyeing, a squirt of soap at this point will help the water penetrate all the way through. Once it’s thoroughly wetted, take the skein out, squeeze out the excess water, and hang to dry. It will drip, so over a sink or bathtub is usually a good idea. It depends a bit on the weight of the yarn, but I usually find it dries if I leave it overnight. And now we’re all set for Part Five: Knitting! Well, almost. First there’s Part 5a: Swatching and then part 5b: Designing the Pattern. So I guess knitting is actually Part Seven. Dyeing is kind of cool, because you can do it at any stage in the process depending on what results you want. Sometimes it’s a good idea to dye before carding, because you can even out any colour differences and worry less about it getting all matted, and if it’s not too dirty you can even dye it before washing, and skip a whole step. Although probably most of the time these days people get their wool already processed, so those two choices have been eliminated. Anyways, dyeing at different times can give you different effects. For regular repeating stripes, I’d do it in the yarn stage, with half the skein in one pot and half in another. For one long shift from one colour to another, I’d probably do it after it had been knitted (or whatever) but you can also get that effect if you paint the roving (there’s a good article on how to manage it here). For a really good, solid colour, dyeing in the wool is best (that’s where the phrase ‘dyed in the wool criminal’ came from – it means they’re a criminal all the way through). 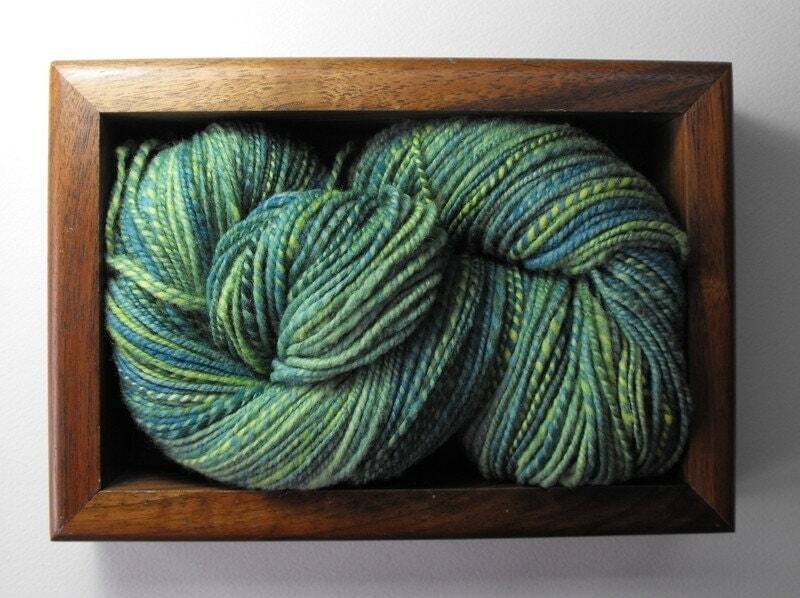 For a speckledy tweedy kind of product, I’d dye in the wool, and then ply three (or four) different colours together. Step One: Place wool in nylon stocking, to give it kind of a roving-like shape. The stocking should help control the mass of wool so it will be less of a giant sticky mass (especially useful if I decide to throw in a skein of something else just for fun). 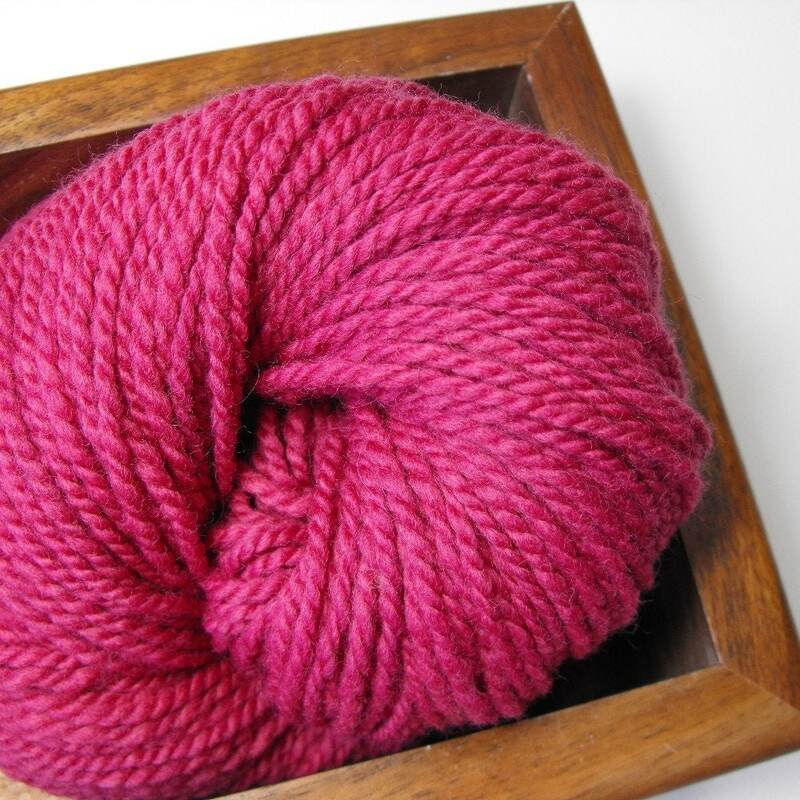 Don’t use your favourite pair – most things that dye wool will dye nylon, too. Counterbalancing it with a known quantity of fibre gave me slightly more accurate results than the old “heft one in each hand and guess” trick. Step Three: Soak in lukewarm water, with a little bit of soap. The soap helps the water get into all the little nooks and crannies inside the stocking. You have to soak it way longer than you’d think, all those little air pockets that make wool so warm are really good at resisting water. And if it’s not wetted all the way through, the dye won’t get to the middle. Step Four: While wool is soaking, make up the mordant solution. Measure the mordant into a small container, add some hot water, then stir until it dissolves. Pour this concentrated solution into your dyepot, with enough water for the wool to float freely. Make sure that the water in the solution is the same temperature as the water the wool is soaking in, the shock of going from cold to hot quickly begins the felting process. Most natural dyes require a mordant to make them light and washfast. Different mordants are required for different types of fibre (primarily split into two categories – plant or animal fibres, like linen vs. wool). They can also be used to change the colour of the final product. Changing the mordant can allow you to get light pink to dark purple, or yellow to green or even black. To get purple from logwood on wool, I’m using alum to mordant it. Step Five: Add wool, begin heating. DO NOT let it boil, the wool will partially felt in an icky, messy shape, and then you’ll have to start all over again. Use a candy thermometer, if you have one, to keep track of the temperature, lowering the heat and/or removing the pot from the element if it starts to get too hot. Step Six: After an hour of not-quite-simmering, remove pot from heat. Let sit for about twenty minutes, to cool to handling temperature. Hang until it stops dripping, but don’t let it dry all the way. At this point, you can take a break and do the actual dyeing in the next day or two, but you should do it within 48 hours, and the wool should stay damp the whole time (wrapped in a wet towel should do). At least, that’s what my instructions say, but I also know people who mordant lots of fabric or yarn at once and then just dye with it as they get the chance. I personally have not experimented with either method to say for sure. Step Seven: Extract the dye. Some natural dyes need to be extracted, some don’t, it depends on what form you get them in. Logwood sawdust just needs to be boiled for about two minutes. Step Eight: Dye, yay! Basically the same process as mordanting. Put the extract in enough water to completely cover the fibre, at the same temperature as the wool already is. Place the wool in the pot, and turn the heat on. Again, don’t let it boil. Not only do you want to avoid felting the wool, logwood is particular about the temperature, the colour will be dulled if it gets too hot. Step Nine: After about 45 minutes, remove pot from heat. Let cool, then remove wool. Step Ten: Wash the wool – soak in water that’s the same temperature as the wool is, with a little bit of soap. Soak again in plain water to rinse out soap and any extra dye particles. Step Eleven: Roll in towel and squeeze out excess water, lay out flat to dry. Step Twelve: Remove from nylon stocking. I like to do this while the wool is still a little bit damp, to cut down on static issues. *I’m using logwood extract from Maiwa Handprints. This section is intended to provide some general procedure tips not included in dye recipes. For full technical instructions, see their handout here. Now that I have some lovely dirt-free, grease free locks, they need to be processed. There are several different tools that can be used to turn freshly washed wool into spinnable wool, and each has a purpose. For this wool, probably the best thing for me to use would be wool combs, which look like a pair of sabre-toothed tiger paws (really!). And apparently a tool so archaic they don’t even have a page on Wikipedia. Umm . . . here’s a pretty good picture. 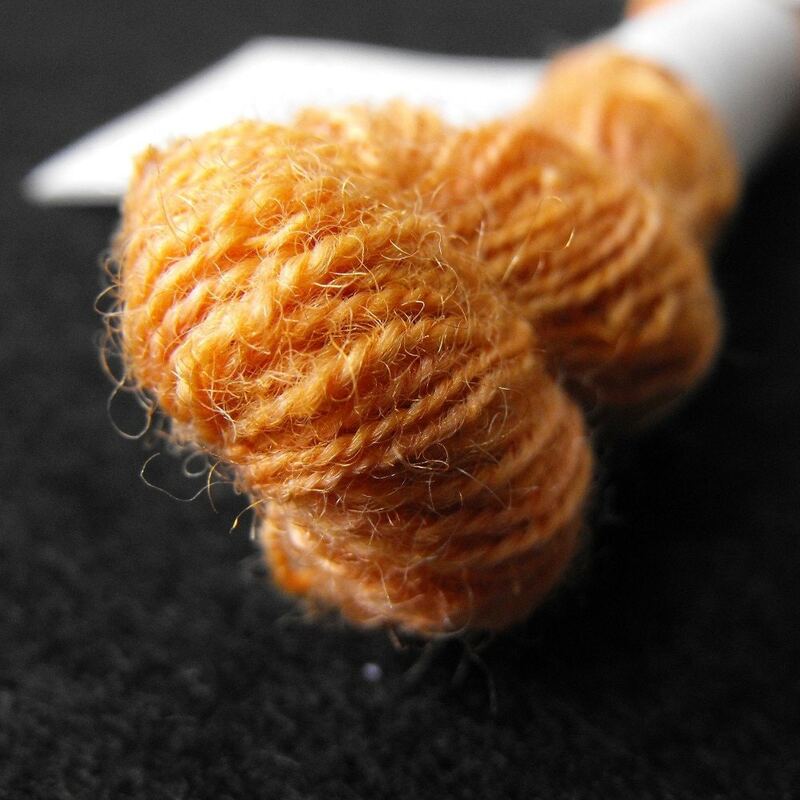 They are generally accepted as the tool for preparing wool for hand spinning – they will straighten the long fibres, sort out the shorter ones (from second cuts during the shearing or just broken hairs),and open up the locks to allow the remaining vegetable matter and dirt to fall out. Carding brushes are generally used on shorter staple fleeces, or the leftover bits from previous combings, for either spinning or felting. Drum carders (hand-crank or electric) are the industrialized version of the hand carders, and will give you a batt, which can be turned into roving, which is commonly what you would buy in a spinning shop. Lately there has been a bit of a fad using drum carders to create art batts (like this purty sparkley one) that are a combination of all sorts of fibres and colours and even some other materials that you wouldn’t normally think to spin. But I’m getting off topic now, so back to it. Unfortunately, I don’t have any combs. Yet. So, on a tip from the shearer from whom I purchased the fleece, I will simply comb the wool with my carding brushes. Observe the lovely pile of washed wool just waiting to be turned into a fluffy cloud of softness . . . Step One: Pull a lock or two out of the bag, enough that I can hold onto it comfortably. Step One-and-a-half: Pick out any big bits of plant. This fleece doesn’t really have any, but if it did, I’d have to take care of them first. Step Two: Holding the lock by the end, brush a couple of inches by the skin side. Step Three: Reverse grip, hold onto newly brushed end, and brush out the tips. Step Four: Place the now beautiful fluffy lock in a pile, put what’s stuck to the brush in the process-more-later pile. Step Five: Repeat, lots and lots of times. This is the first video I’ve ever done, so . . . I’m sorry. This is a fleece I bought last summer, from a Shetland/Cotswold crossbreed lamb. It’s quite beautiful, and I’ve very much enjoyed working with it so far. The staple (length of the hairs) is quite long, 6-8 inches, with a moderate amount of crimp (waviness). Very soft and silky smooth, and takes dye like anything. Doesn’t look like much in this state, does it? Apparatus: Strainer from salad spinner, large, deep bowl, old towel(s), Orvus Paste (or Ivory dish soap), raw wool. Step One: Fill bowl with the hottest water from the tap (hot water melts and dissolves the lanolin). Step Two: Fill strainer with dirty wool. Step Three: Gently immerse wool in water. Do not swirl, squish, or agitate in any way, just let it soak for 10-15 minutes. 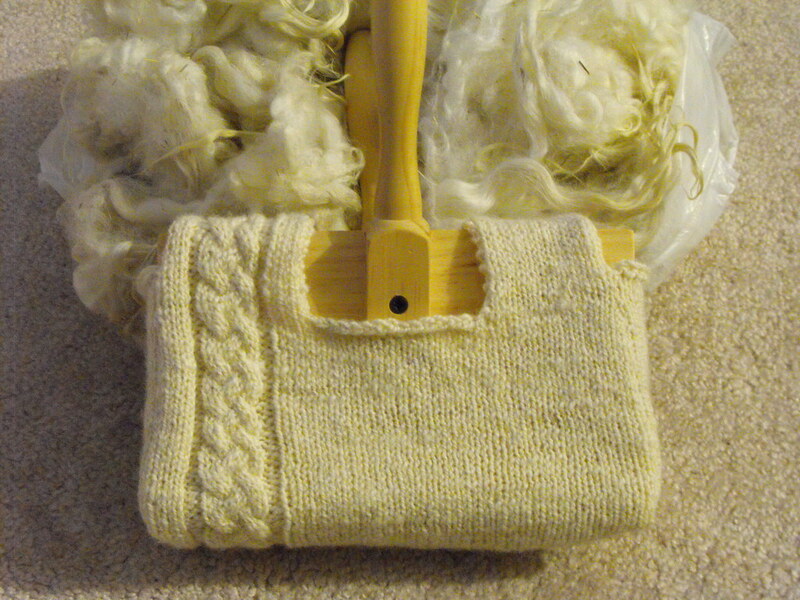 Don’t wait so long that the water gets cold, or the lanolin will solidify back onto the wool. Step Four: Remove strainer full of wool. Pour dirty water onto garden or lawn. Don’t put it down the drain, it is a) illegal (at least it is in my city), because it clogs them and b) unwise, because it clogs them. Plus c) it’s good fertilizer. Step Five: Repeat steps one through four until water is more or less clear. For this fleece, I’ll probably do three or four rounds. Step Six: Fill bowl with hot water as before, but also add a kettleful of boiling water (hotter will melt off more lanolin) and a small amount of Orvus Paste. Gently stir the soap in last, if you add it first, you’ll get lots of suds that will take forever to rinse out of the wool. Step Seven: Let sit as before, maybe a bit longer, but again, don’t let the water get cold. Dump the water as before. Step Eight: One more round, to rinse off the soap. Step Nine: Let wool drain for a while in the strainer. Step Ten: Remove wool from strainer, and lay out on an old towel. Roll towels up and squeeze (don’t wring!). Step Eleven: Unroll towel, transfer damp wool to fresh, dry towel. If you’re feeling really fancy, toss the second towel in the dryer for a couple of minutes so it’s warm and will dry the wool just that much faster. Step Twelve: Wait. Cover with tea towels if you have animals that will hop up on the table and try to play with the fresh clean sheepiness (I’m looking at you, Opus!). Again, if it was summer, I’d just lay it out on the lawn and the sun would dry it out MUCH faster. Instead, I’ll probably have to wait overnight. Step Thirteen: Marvel at the difference between the dirty wool and the clean wool. Stay tuned for Part Two: Carding! The next several posts will be two projects I’ve been meaning to do for a while. The first part is simple – I want to make a tea cozy for my boyfriend’s lovely little Japanese teapot. It’s perfect for an afternoon’s worth of tea, but it needs some equally cute insulation to keep it hot for a couple of hours. The second part is more fun – I’m going to document the whole process, in detail. Beginning with the raw Shetland/Cotswold fleece I got last summer (“Beryl’s ram lamb”) through washing, carding, spinning, dyeing, knitting, and probably felting the final product. Maybe some embroidery. *OK, I confess most of the reason that I’m doing the second part now is for a school blog assignment. But still. It will be fun.